NEW! Follow the picture guide to help you complete the transport pictures. We have boats, planes, cars and more to get children drawing and puzzling. Look very closely at the bottom picture - it will help you fill in the missing parts of the picture above and complete our bicycle picture puzzle. 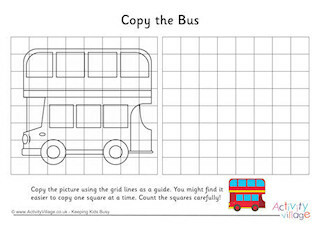 Young children will love this simple introduction to our "complete the picture puzzles". Look closely at the bottom picture and use the information to complete the top picture to match. This nice simple lorry picture is a good introduction to our complete the picture puzzles. Encourage children to look closely at the bottom picture to help them fill in the missing parts of the top lorry. Complete the motorbike on this puzzle. It's one of a fun set of complete the transport picture puzzles. This racing car won't win any races without any wheels! Children need to look closely at the bottom picture to help them complete the racing car. Is the bus ready to take you back to school? Looks like some parts are missing to me! Complete the school bus and then colour it in a bright yellow. This ship has a funnel and several portholes missing! Children need to use the picture below to help them complete the top ship, a fun test of observational skills.